The 17th part in the GINZA×CSR series introduces the Ginza Grand Hotel that is a core facility of Granvista Hotels & Resorts. 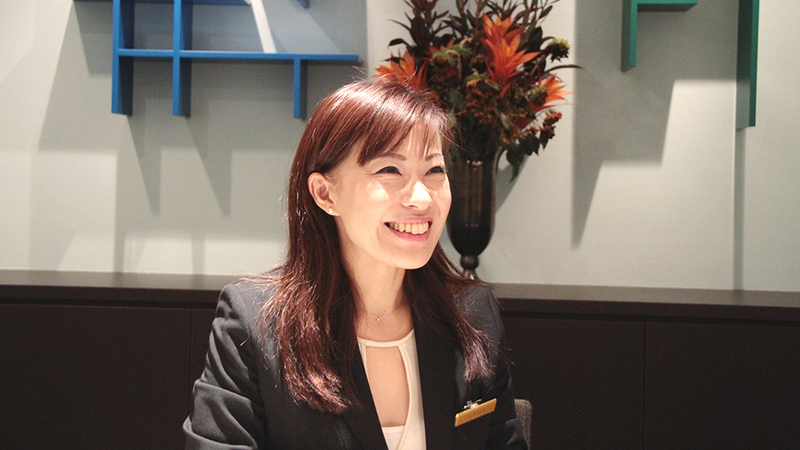 After completing vast renovations, it held a grand opening in May 2014 as a hotel that would share Ginza’s value with the world based on the corporate vision of “local values shaping the global future.” We asked General Manager Yayoi Naka about the “Shaping the Global Future” program for creating shared value being pursued by the Granvista Group. ─ Granvista Hotels & Resorts runs a variety of facilities around the country in addition to historic hotels. We have places around Japan, including city hotels, business hotels, resort hotels, a marine recreation complex, highway oasis restaurants and more. The Sapporo Grand Hotel that was Hokkaido’s first genuine Western-style hotel is celebrating its 80th anniversary this year. ─ I imagine there weren’t many large buildings in Sapporo 80 years ago. No, there weren’t. Establishing a hotel in that type of environment means changing the cityscape, the flow of people and even culture, for example by introducing menus with English notation for the first time. Granvista believes in this power of hotels and strives to create a top local place while treasuring local value. ─ So, the history of continuously sharing local value with the world is the base of the current management philosophy? Our corporate vision is “local values shaping the global future.” Of course it is also important to provide services that satisfy customers in the present. But, at the same time, we also want to think about our business activities on a global scale to ensure sustainability in the coming years. This may mean when we are still living or after we have passed. Based on this idea, all group companies pursue activities in the “Shaping the Global Future” project for creating shared value with the community and customers. The program was launched in January 2014 with themes of “passing on and creating diverse culture” and “active coexistence with nature,” to develop values with which the world could sympathize. ─ What kind of activities are carried out by the companies? They all started with the establishment of Granvista Farm Sapporo near Sapporo in Hokkaido. Vegetables are farmed there without pesticides or fertilizers under the instruction of Akinori Kimura who successfully produced apples without pesticides or fertilizers for the first time in the world and is also well-known for his book Kiseki no Ringo (“Miracle Apples”) that was made into a movie. Vegetables harvested in this farm are used at group hotel restaurants and occasionally at markets in Tokyo. Our business is in providing hospitality through many eating establishments. That is why we started with an initiative related to “food” — something we offer to customers on a daily basis. ─ What kind of activities are carried out at the facilities? We held an event called “Granvista Candle Night” at our business establishments in July and September, thinking it would be great to create opportunities to think about environmental topics, such as the burden on the environment and energy problems. On the evening of July 7, as many lights as possible were extinguished and everyone participated in a candle lit moment. Also, on September 16 that is the International Day for the Preservation of the Ozone Layer, we held a campaign during which customers can order a donation-attached course where part of the proceeds were donated to a forest preservation organization called More Trees. ─ The Ginza Grand Hotel just re-opened in May 2014 after large-scale renovations to its predecessor, Hotel Com’s Ginza. The hotel was re-created as the physical embodiment of Granvista’s business philosophy and management approach. We are aiming to run a hotel that considers nature and sustainability while sharing Ginza values with the world. For example, the restaurant sells coffee made from coffee beans that have been procured from Rainforest Alliance certified farms. With this selection, you can enjoy high quality coffee while also helping protect rainforests and wildlife and improve the living environment of farm workers in producing countries. In addition, we choose our bath amenities based on two criteria. One, the production process of the product must be considerate towards animal welfare (no animal testing) and two, the product must have a minimal burden on the environment and be highly biodegradable. We will help preserve the natural environment by re-examining everyday items. Every Wednesday, the hotel holds a social event called Wednesday Grand Night in its ground floor cafe space. We hope this platform will give opportunities to the community, for example as a place for nearby companies to present their CSR activities. ─ Is there anything you try to keep in mind when shaping that philosophy into concrete form? I always stress the possibility of continuity when deciding whether or not to try out a new idea. No real value is created with short-lasting projects, even if they attract attention. Conversely, if the project has intrinsic value it will probably continue. ─ How do you instill the concept and significance of Shaping the Global Future within all the staff? We created a branding project team of staff selected from management teams in accommodation, food and beverages, personnel affairs and accounting, and so on. We create opportunities for them to discuss branding once a month, during which they talk about the Shaping the Global Future project in a common language. We also communicate the concepts in quarterly meetings for the entire staff. Indeed, there is no value unless the staff, who interact directly with customers, truly understand the concepts. We built the team because we want the staff to take the initiative themselves. ─ Managers and staff members who focus on profits and day-to-day affairs hold a different viewpoint. Is it difficult unifying their attitude for the future? Accommodation and restaurant managers are mindful of three things in management: customer satisfaction, profits and what the staff think. If the staff are not satisfied, it will transfer to their service for customers, which will in turn affect customer satisfaction and profits. These three points are closely interrelated, and creating a positive cycle is the key. In addition to these three viewpoints, we also focus on the near future. Of course, the hotel is brand new, so instead of moving forward with numerous concepts at the same time, we are slowly infusing the concept of the near future into the important perspectives of management. We hope to take our time instilling the concept in staff that both are equally important. ─ What is important in disseminating these concepts to the staff? You can make a lovely booklet outlining the corporate philosophy and distribute it to the staff, but if the philosophy is not congruent with day-to-day affairs, it will never become a living article. If we try to stop and think “does this fit with our style?” every time we are doing daily tasks together, or having a meal or talking in the staff office, I think the philosophy will slowly infiltrate daily tasks and the value will be communicated to customers. Also, I want to create this type of work environment where everyone can naturally make suggestions to one another. It is the staff that deal directly with customers that have a lot of knowledge and experience. Our role is to draw it out. ─ What do you think about Ginza’s intrinsic value? Apparently there is something called the “Ginza filter” in this district. Ginza is home to both old standing shops and the latest fast fashion brand shops. There are all sorts of businesses here, but there is an invisible filter through which companies that will not last in Ginza are naturally weeded out. The ones remaining after passing through the Ginza filter are surely those that do not shift from the core essence. It is because there is something that consistently pierces the hearts of all people that a business is welcomed by Ginza customers who know what’s good and bad. Employed at Park Hyatt Tokyo in 1994. Worked as staff at the Ritz-Carlton, Osaka for its opening and at the Busena Terrace, then became assistant manager of Hakone Suishoen in 2007. Became manager of Hotel Asyl Nara in 2009. Joined Granvista Hotels & Resorts in 2013. Assumed post as general manager of Granvista Hotels & Resorts in May 2014.